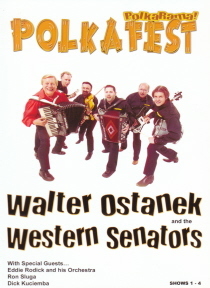 Import DVD with Canada's Polka King Walter Ostanek, The Western Senators, Eddie Rodick, and more! The Western Senators have been playing music for many years. They have traveled the United States and Canada for decades. On many occasions they have teamed up with Canada's Polka King, Three-time Grammy® award winner Walter Ostanek. This is a great production with some excellent music throughout the DVD!